I wrote this song after hearing a message by the same name. 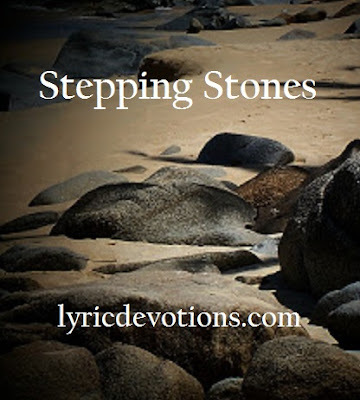 I’ve since heard others talk about turning stumbling blocks into stepping stones, but at the time it was a new expression to me; one that called out to be a song! In the months after writing this song, it began to take on a more personal meaning. Plagued with flooding problems in our basement, we decided the only solution was to move our house. We knew beyond a shadow of a doubt that we were following the Lord’s will. Had we not been completely convinced of this, we surely would have questioned our decision many times along the way. As it was, the Lord gave us complete peace throughout the whole ordeal, in spite of a lot of headaches! He had brought us far enough on this journey that one thing we knew for sure: following God’s will doesn’t always mean that the road he takes us down is going to be the easy one. In fact, it’s often our own detours that make it necessary for the Lord to take us down a more difficult path. But in spite of all our missteps the Lord is always there waiting to lead us on. If only we listen, he’ll show us how to turn those stumbling blocks into stepping stones. And oh, what peace we find when we’re once again walking in his light! Sometimes our problems block the view, and we can’t see which way to go. But God always makes a way out through rocks and rubble on the road. Don’t let them be a hindrance; let Jesus help you lift the load. Just pick up those rocks and move them. 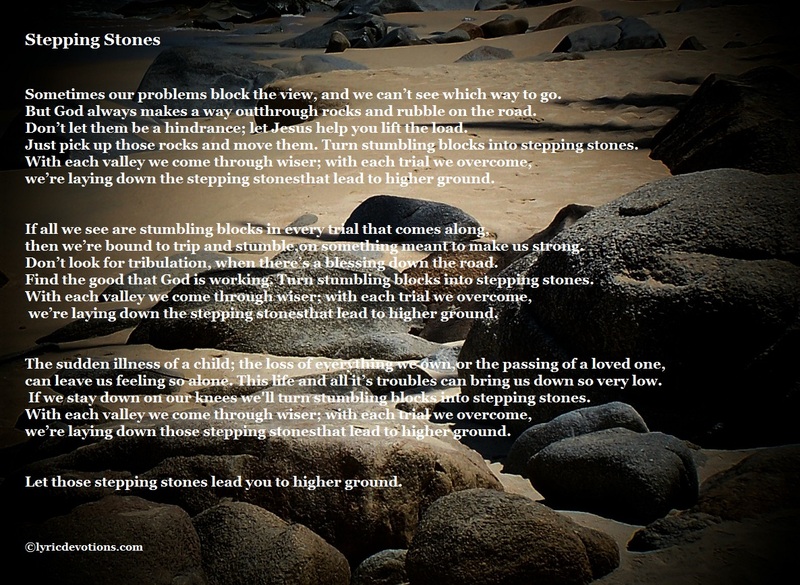 we’re laying down the stepping stones that lead to higher ground. then we’re bound to trip and stumble, on something meant to make us strong. Don’t look for tribulation, when there’s a blessing down the road. Find the good that God is working. or the passing of a loved one, can leave us feeling so alone. This life and all it’s troubles can bring us down so very low. we’re laying down those stepping stones that lead to higher ground. Let those stepping stones lead you to higher ground. 1 Peter 2:6-8 Wherefore also it is contained in the scripture, Behold, I lay in Zion a chief corner stone, elect, precious: and he that believeth on him shall not be confounded. Unto you therefore which believe he is precious: but unto them which be disobedient, the stone which the builders disallowed, the same is made the head of the corner, And a stone of stumbling, and a rock of offense, even to them which stumble at the word, being disobedient: whereunto also they were appointed. Romans 8:28 And we know that all things work together for good to them that love God, to them that are called according to his purpose. I've stepped a few of my own in recent days. It's been tricky at times, trying to navigate the current that overruns the rocks, but with God at the lead and with my hand in his, the outcome is the same. Safe landing on the other side. May God be your portion as you move forward in your faith to take hold of all of that for which he has taken hold of you. Thank you for your prayers, sister. Be blessed in your well-doing this day. That's a new way of thinking about stumbling blocks, so thank you for that. I'm sure it will be encouraging when times of trouble come. Yes, if we're to live victoriously for Christ, it's the only positive way of thinking of stumbling blocks. Thanks for stopping by! That's beautiful. I love that you're using your God-given talent to make a joyful noise for Him. Thank you Kathi. God gave Terry a beautiful voice to sing his praise! All glory to Him! Yes he is! We just need to follow where he leads! Thanks for stopping by! Such beautiful lyrics, Deborah! I just love this message. Trusting Him no matter what the road looks like... Thank you for sharing. Thank you Char, I'm glad you enjoyed it.